Just like the yellow sapphire, a ruby gemstone is also derived from corundum (aluminum oxide). The difference being that there is chromium in the ruby, giving it the distinctive red color. The trivalent chromium replaces the aluminum in the crystal structure to give us the ruby. Rubies are generally considered more valuable if they have darker shades of red. The red ruby is generally resistant to acids and has a score of 10 on the Moh’s scale of hardness. 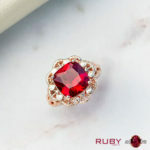 An authentic red ruby would look bright red when seen under light. A pale colored ruby might not be completely authentic. 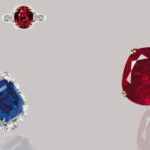 Depending on the number and quantity of trace minerals found in a ruby stone, each sample would have different clarity. The interesting thing about chromium is that it inhibits the growth of the crystal after a certain level, so you would most commonly find rubies only up to 10 carats. But stones below 5 carats are also not that valuable. Apart from the physical beauty it has, a red ruby also brings several benefits to the wearer. It is believed to improve blood circulation and also regulates blood pressure. For women, it helps in regularizing the menstrual cycle. 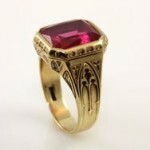 The ruby is believed to contain and emit all the energy and strength of the sun. The wearer of ruby would find his natural leadership qualities and self-confidence improved. The wearer would find that his confusion and self-doubts are dispelled when he or she wears red ruby. Overall, a red ruby does help in enhancing the wearer’s personality. The yellow sapphire gemstone is one of the hardest gemstones we know, with a hardness index of 9 on the Moh’s Scale. It is rivaled only by diamond in hardness, which has a score of 10 on the same scale. The base mineral for yellow topaz is corundum which is mineral of aluminum oxide. This is a gemstone that scores very highly on clarity. But when subjected to high temperatures, the yellow sapphire looks a little dull. This is a convenient way to distinguish between clear and transparent natural yellow sapphire and treated synthetic yellow sapphire. We usually see traces of iron and titanium in yellow sapphire. In fact, the purest form of sapphire is the colorless variety. When we mine yellow sapphire, it is very uncommon to find a stone with zero inclusions and impurities. Yellow sapphire is mined in a number of countries today, but the best variety comes from Sri Lanka. The yellow sapphire is usually associated with the planet Jupiter. Jupiter has been long regarded as the teacher of the Gods. That is why similar properties of learning and knowledge are associated with the yellow sapphire. Jupiter is believed to emit a benevolent light, which we see a reflection of in the yellow sapphire. The yellow sapphire can add to the knowledge and therefore the professional success of a person, which can, in turn, lead to wealth. Yellow sapphire is also known for its healing properties and can protect the wearer from a number of diseases. 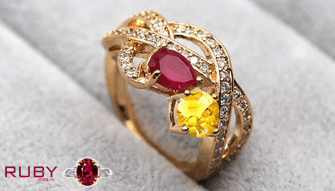 As we said above, the yellow sapphire is associated with the benevolent teacher Jupiter, while the red ruby is associated with the energy provider Sun. Both gemstones have their distinct advantages for the wearer. But let us also look at the effects of wearing yellow sapphire and ruby together. 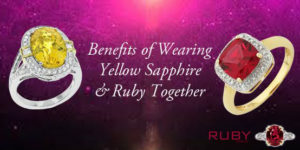 Since both Jupiter and Sun are considered friendly to each other, therefore the adornment of both yellow sapphire and ruby together usually is beneficial. But every person might not get the same extent of benefits. As per Vedic astrology, each person’s horoscope is unique and is composed of houses, which are referred to as lagnas. Every person’s lagna (or ascendant) is decided on the basis of the time and date of birth as well as the place of birth. When your ascendant is Aries (mesh lagna), the Sun bestows its powers on creativity and higher education. At the same time, Jupiter is attuned towards professional success. 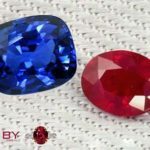 If a person with Aries ascendant wears a combination of blue sapphire and a red ruby, these aspects of his or her life can expect to see beneficial effects. This ascendant is also referred to as the Simha lagna. For such people, the Sun provides health and prosperity, and Jupiter holds up creativity, education, and personal possessions. Some people report struggles and dissatisfaction with this combination, in which case a red coral can be used to replace the yellow sapphire. People with the Dhanu lagna get prosperity and health from Jupiter, while the Sun would provide good fortune. For best results of this combination, the two gemstones must be mounted on a ring or pendant in such a way that the stones touch the skin of the wearer.